Posted April 24, 2017 by Josette Farrell in News. Plean Teanga don Ghaeilge i do cheantar. Tá deis agat páirt a ghlacadh. 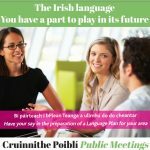 An Irish Language Plan for your area. Have your say. Beidh tús á chur go luath le hobair ar Phlean Teanga i do cheantar le húsáid na Gaeilge a neartú agus a threisiú. Beidh an obair seo á dhéanamh mar chuid den phróiseas pleanála teanga atá ar siúl sa Ghaeltacht faoi láthair. Tá sé mar sprioc ag an bpróiseas sin tacú níos fearr leis an nGaeilge mar theanga pobail agus teaghlaigh i gceantair Ghaeltachta. Tá sé mar aidhm ag an bplean teanga gníomhaíochtaí a leagan amach agus a fheidhmiú a chuirfidh le húsáid na Gaeilge sa teaghlach, sa phobal, i struchtúir an oideachais, gnó, sóisialta agus poiblí i Limistéar Pleanála Teanga An tEachréidh. 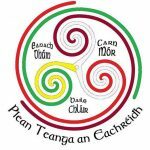 Tá cruinniú poiblí á eagrú le heolas a thabhairt don phobal maidir leis an bpróiseas pleanála teanga agus na deiseanna atá ann anois plean nua don Ghaeilge a fhorbairt don cheantar. Tá deis agat mar dhuine aonair páirt a ghlacadh san iarracht seo agus do thuairimí a thabhairt. Beidh cruinniú poiblí á reáchtáil in Óstán Claregalway, Dé Máirt, 25 Aibreán ag a 8.00 i.n. 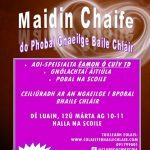 Cuimsíonn LPT An tEachréidh na bailte fearainn seo a leanas: Eanach Dhúin, Coill Uachtar, Baile Chlár, An Carn Mór. Beidh seirbhís ateangaireachta comhuainí ar fáil le linn an chruinnithe. 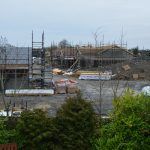 Steps are currently being undertaken to begin the development and implementation of an Irish Language Plan in the areas surrounding Galway city. 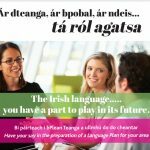 This work is central to the language planning process that is taking place currently in the Gaeltacht, and aims to revitalise, support and strengthen the Irish language in those areas. 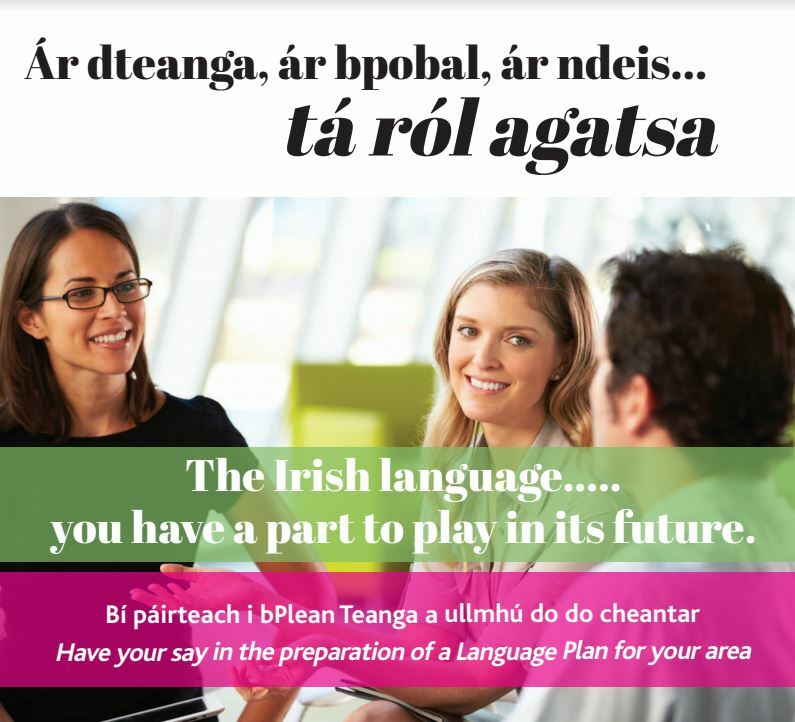 The Irish Language Plan aims to set out a range of initiatives and measures that will promote, support and increase the use of Irish in everyday life in the home, the community, in education and in social, business and public structures in the Language Planning Area of An tEachréidh. We invite you to get involved in this initiative. 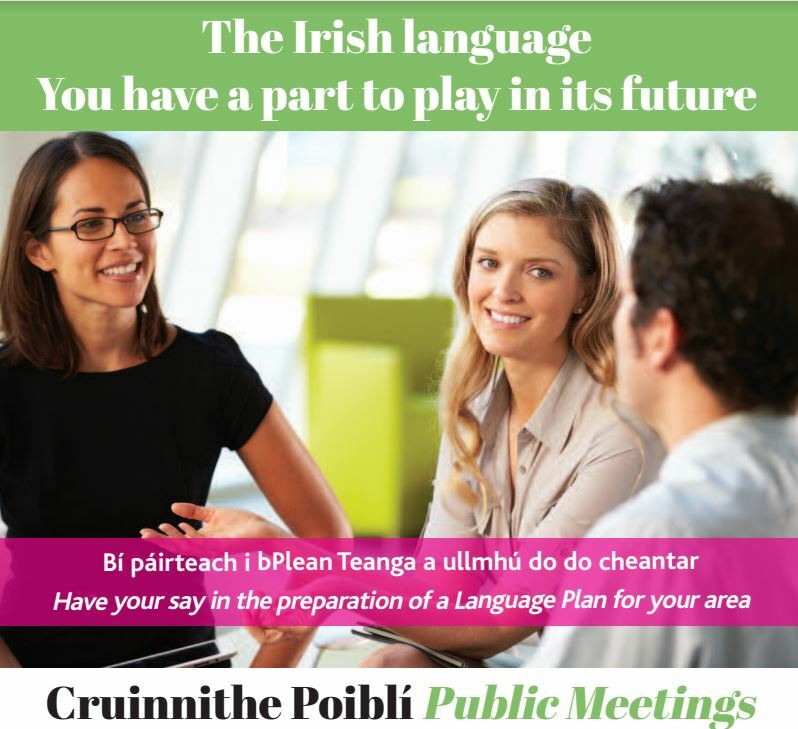 A public information meeting will be held in the Claregalway Hotel, Tuesday, 25 April at 8.00pm to inform the communities in the Eachréidh Language Planning Area, which includes the townlands of Eanach Dhúin, Coill Uachtar, Baile Chlár, An Carn Mór. (Annaghdown, Kilroughter, Claregalway, Carnmore). A simultaneous translation service will be provided during the meeting. Gaeltacht Survey for Annaghadown, Claregalway and Carnmore.